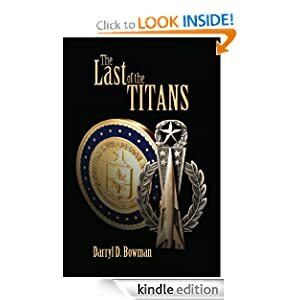 After the suspicious death of his family, former Air Force Captain Kirk Cule discovers hidden journals and the covert world of his father; a good man drawn into a power struggle that could lead to worldwide nuclear annihilation. Kirk enters the murky world of a rogue CIA Special Actions Group Chief, an exceptional madman named Donner Bly, his deranged obedient associate, and foreign entities, as they race to unearth and launch the one remaining nuclear-tipped Titan Inter-continental Ballistic Missile. All have different motives....all have different goals. But who will succeed as they battle to possess The Last of the Titans. Oooh! Classic battle of anti-hero and hero emerges as the plot is developed into a thriller that is filled with fun backstories. The book starts off a bit boring with long winded paragraphs and an ominous threat from the CIA. I kinda liked it. The book started to get a bit stagnated especially if you have a low attention span. Then it started to heated up a bit like a slow boil. The tea kettle sure did whistle though and the ending was real well not predictable unless you are a master reader. 4/5 Good solid plot, character development, and the whole bag of goodies just the book takes a bit to get to a nice place. Really recommend it if your into military.